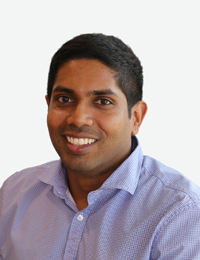 Dr Lahiru holds a Doctor of Dental Medicine from University of Western Australia and a Bachelor of Engineering with Honours from Curtin University. He thoroughly enjoys patient interaction and delights in meeting a variety of patients every day and building long-standing relationships with care. I really enjoy preventative treatment and patient education, as preventing problems is most rewarding. I relish the opportunity to provide the best possible care for my patients no matter their treatment needs. Dr Lahiru will continue to attend as many CPD courses as possible to ensure life-long learning throughout his career. Dr Lahiru believes this is important to deliver optimum patient care and evidence-based treatment. When not at Dentist WA Canning Vale Dr Lahiru loves eating and trying out different cuisines, travelling whenever possible and mainly dictated by the cuisines he wishes to try. As a dedicated foodie he stays healthy by going to the gym and playing sport. Book an appointment with Dr Lahiru.